The small yet perfectly formed island of Gozo is surrounded by crystal-clear Mediterranean waters and sits just 5km from its bigger, livelier sister Malta. Join us on this unique multi-activity holiday were we can explore this fascinating island further - on foot, by hand, two wheels and on water! Our unique multi activity holiday gives us the chance to gives us the opportunity to discover this charming island, where each village tries to outdo the next with the fabulous churches and basilicas. Europe’s third largest domed church can be found on the island, and ancient fortresses and temples are not in short supply either! 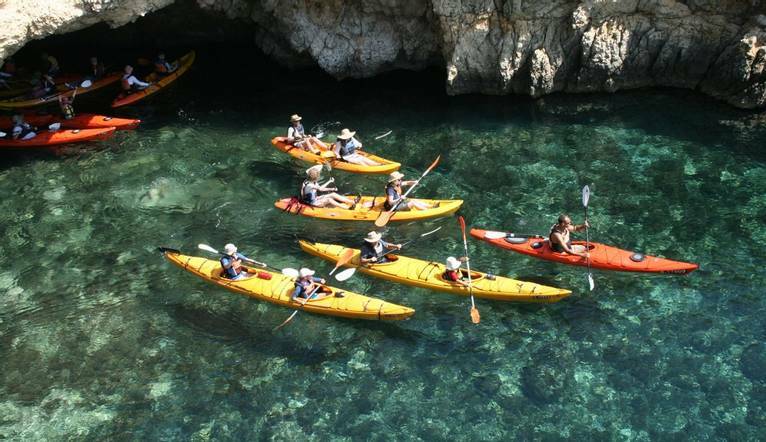 We can explore the wonderfully wild coastal paths and cliffs, with turquoise blue waters shimmering below and spectacular views over to Malta and Comino, cycle along the quiet country roads and discover the hidden coves of Gozo’s pretty coastline by kayak. On our free days we can explore this pretty island further from our base or we can discover the marine life under the waves on an optional scuba diving excursion. Gozo is a small, unspoiled island with a beautiful coastline and sunny Mediterranean climate which make it perfect for walking! Today we can enjoy wonderful sea views against the weathered coast and dramatic inland landscape, made up of small flat-topped hills. Wild fennel, carob and oleander are common sights, alongside abundant prickly pears. A small picnic lunch is included today. Explore Gozo and Comino (its neighbouring island) varied coastline by kayak, and enjoy some spectacular scenery from a completely different perspective. Visit sea caves, secluded beaches and picturesque inlets all using muscle power, rather than polluting petrol. Snorkels are also provided, so we can take a dip in the beautiful, blue Mediterranean. Gozo is the ideal place for rock climbing, located in the middle of the Mediterranean Sea it offers unrivalled climbing opportunities. Originally developed by the British Military whilst they were based on the island the craggy limestone rock, washed out by millennia of rainfall makes it undoubtedly an undiscovered climbing paradise! Gozo has a great deal to offer a cyclist and is becoming a popular activity with locals and visitors alike. The route will aim to avoid major hills, and travel down country roads and tracks and along the sea cliffs to see the most spectacular views and quaint villages. Our guide will offer a balance of easy and fun riding. Four organised activities are included in the programme. It is your responsibility to ensure that you are fit and well enough to take part in your chosen activity holiday. If you are unsure as to whether the activities are within your capabilities, please contact the office to discuss. Please note; you could be walking across uneven ground in some areas and extreme care must be taken, especially if wet. If used to using a pole/stick, it is advisable to bring it. Please appreciate the itinerary and content of the holiday may change at the time and at the discretion of the guide/organiser, should local conditions require. Solo’s Holidays Ltd cannot be held responsible for personal injury, accident or damage to property whilst on these activities other than incidents arising out of the company’s negligence. The guide has the right to refuse to guide an activity with anyone not properly attired. For important information relating to activities holidays, see Medical Conditions here. Activities may be changed due to adverse weather conditions.